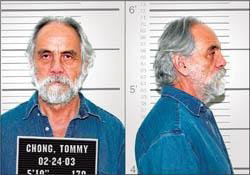 It is reported that Tommy Chong (of Cheech and Chong) wants President Obama to grant him a presidential pardon for a 2003 offense (conspiring to distribute drug paraphernalia across state lines) that resulted in a nine-month federal prison sentence and a $20,000 fine. He was looking at the possibility of a full year in prison and a fine of up to $250,000. "Of everybody [the Justice Department] busted, I was the only one that had international recognition, and so they really wanted me ... Technically, I wasn't the owner of the bong company — that was my son — and my wife was vulnerable because she wrote a check for my son's company. They told me that if I pled guilty, they wouldn't go after my son or my wife, and so of course I had no choice."